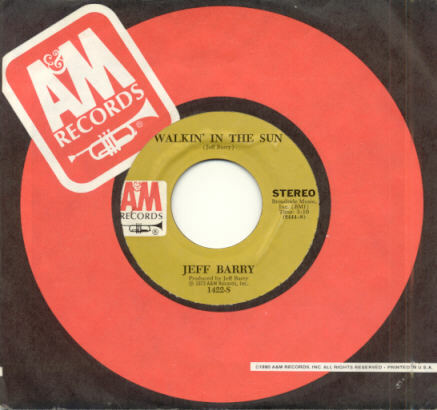 Personal note from Laura: "Walkin' in the Sun" is one of my favorite Jeff Barry songs. He released it as a single in 1973, but I didn't hear it for the first time until recently. It absolutely blew me away! Not only does it have a cool melody with a slight country feel and a groovy guitar lick, the message contained within its lyrics is profoundly inspiring to me - the realization that the bad times don't last forever and only help you to appreciate the good times when they arrive. "My father was blind, and the inspiration for the song came from an incident [that took place] when I was a teenager. I was walking with my dad in New York City, and it was late in the afternoon. We were a little chilly, as the tall buildings were shading the sun. My dad said, 'Is the sun out on the other side of the street?' Well, of course it was. I wrote the song about 25 years later and I didn't realize that the song title came from that day 'til years after that." And even the blind man can tell when he's walking in the sun. (O Lord) Even the blind man can tell when he's walking in the sun.